Soh is No Average Joe! Joe Soh of Malaysia proved that he was no average Joe! After coming in 2nd at Grand Prix Kobe 2015, he improved upon his performance to take home the trophy this weekend! This weekend, 2,802 players showed up at Grand Prix Kobe for yet another trial of their lifetime. Since this was the first Modern Premier Event to utilize Amonkhet, there was plenty of room for innovation! Taking down the entire event with White-Black Eldrazi, Joe Soh's home brew proved that it was capable of braving the elements! Sneaking into his third lifetime Grand Prix Top 8 in 8th seed, Soh was disadvantaged in the playoffs, but he turned that around by defeating Tomoya Tsubouchi in the quarterfinals as well as Park Bi-o in the semifinals, before dispatching finalist Terumasa Kojima in two quick games. Also making the Top 8 were semifinalist Fumiyasu Suzuike, as well as quarterfinalists Ryoichi Tamada, Akio Chiba, and Takeshi Kagawa. Having come in 2nd place at Grand Prix Kobe 2015, Soh improved upon that performance by one place, which was sufficient to earn a prize which he truly deserved, the Grand Prix Kobe 2017 Champion trophy! Once again, congratulations to Joe Soh for this long-awaited victory! You've proven that you're no average Joe! Welcome to Kobe, a picturesque Port Town blessed with calm waters and refreshing breeze! 2802 players arrived at the International Exhibition Hall but after nine rounds of Modern, “only” 868 players will return tomorrow for Day 2. 10 players managed the perfect 9-0 record, namely Hiroshi Kawakami, Hiroshi Shiroma, Kazuhiro Noine, Genta Sakamoto, Yuu Sugiyama and Kenta Masukado from Japan, as well as Huang Ta-chi from Chinese Taipei, Wu Kon Fai from Hong Kong and Shin Jong-ho from South Korea! An honorable mention goes to Peng Jianjia for being the sole 8-0-1, and he is also technically undefeated! 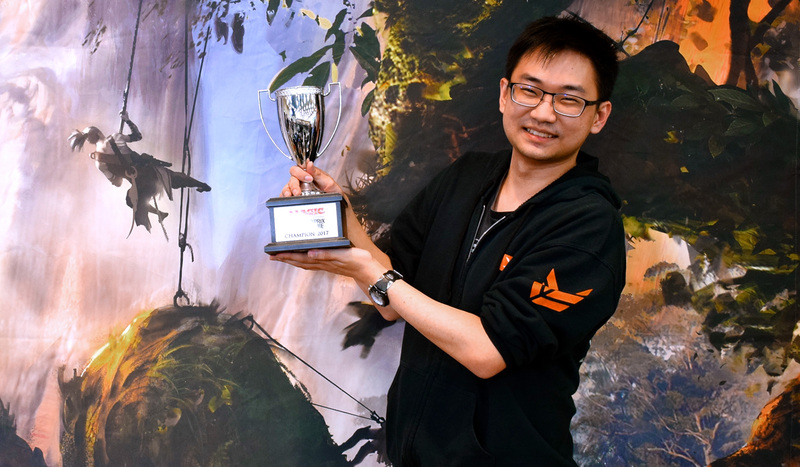 At 8-1, the most notable names are Pro Tour Battle for Zendikar finalist Ryoichi Tamada, Modern Master (8) Lee Shi Tian, China's first and only Gold Pro Liu Yuchen, Grand Prix 2015 finalist Joe Soh, Grand Prix Taipei 2005 Champion Osamu Fujita, Hall of Famer Makihito Mihara and two-time Pro Tour Top 8 competitor Chikara Nakajima! That's a lot of star power right there! Making it through to Day 2 are also Japanese veteran Akira Asahara, Gold Pro Huang Hao-Shan, six-time Grand Prix Top 8 competitor Nicholas Wong, Platinum Pro (10) Kelvin Chew, three-time Grand Prix Champion Yuuki Ichikawa, former Player of the Year Jeremy Dezani, Grand Prix Chiba Champion (20) Kentaro Yamamoto and World Magic Cup Champion Tzu Ching Kuo. This list of players are all at 7-2 and have a shot at the Top 8 tomorrow! On the other hand, despite scraping into Day 2 at 6-3, we don't really expect (5) Yuuya Watanabe to be cracking the Top 8. Has Amonkhet changed the face of Modern forever? We'll find out tomorrow!